Visit Bletchley Park and stay at one of our hotels. Oxfordshire Hotels offers quality refurbished Village Hotels and Country Inns near Oxford City, Banbury, Milton Keynes and Buckingham in South East England. Oxfordshire Hotels are ideally situated for visiting the Cotswolds and many local attractions such as Blenheim Palace, Bletchley Park, Bicester Village Designer Shopping, Silverstone, Warwick Castle, Oxford City, and many famous Stately Homes and Gardens. Located near M40 and M1 motorway connections for Birmingham or London, make our hotels a popular choice for a short break away or weekend break for two. What makes Oxfordshire Hotels different, to the hotel chains, is the personal & professional service, the award winning restaurants, and comfortable quality village hotel accommodation. Book direct and save when booking one or more of our special offers. 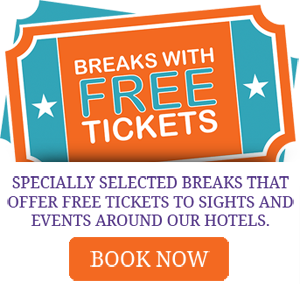 Specially selected breaks that offer free tickets to sights and events around our hotels. Two night stay with complimentary dinner first night. The relaxing way to enjoy a local wedding celebration with friends and relations. Enjoy 2 or 3 night stays at the hotel of your choice and choose from seven great golf courses. Join the Restaurant Club and receive Special offers and Discounts. Your free personalised discount card will be sent to you by post.